Georgia (nee Zacharias) Hedrick was born in a cave on the South Side of Chicago and raised by wolves. Her parents decided that this was the best way to account for her unusual behavior. This is the story they told to all the neighbors. You see, she used to draw on everything she could reach. Paper was at a premium, but walls were not. The Zacharias' family walls were constantly being redecorated. Growing up above the family corner Grocery Store limited her choice of walls as the apartment only had four rooms, three of which were heated. Launching her talent into the butcher paper in the store assured every customer of designer butcher paper. This was not appreciated by her Grandfather who had founded the store. She went to Catholic Schools, and became addicted to her Faith to the degree that she became a nun, a Daughter of Charity. However, after 15 years, when she decided she had given it a good try, and where she grew tired of always being called to the MotherHouse for this or that of what she considered trivia, she launched out on her own. Knowing nothing real, and believing in everyone, feel free to imagine the next 3 years of her life. After that, she drove to California, met a guy paying his rent, believed in him, and he, in her, married him, and they are still married after 24 years. Writing was her mainstay throughout all her life. She still has her 8th grade journal and her college papers, as well as journals she has kept over the years. Periodically, the writings burst out in magazine print, such as in AMERICA, CREATIVE CLASSROOM, and NEVADA WOMAN. Now she has gone ebooking it. 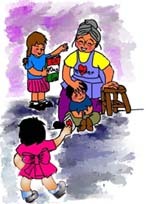 CLOUDWOMAN is her first published ebook at her tender age of 61, where life really does, just begin. Author Georgia Hedrick offers this parable, her work of fiction about a King and his "Edict Of Accountability," and how a skilled teacher led him to issue his "Edict of Freedom From Testing." Once upon a time, there was a Kingdom filled with schools. In these schools burbled and squirbled a lot of children quite happy to be there. Teachers taught in these schools quite joyfully. It was a fun time of learning for everyone. Into this Kingdom one day came a Mighty King. He said to himself, "Ah, methinks, I shall be quite comfortable here! There are many children for whom I might be a father-figure. There are many teachers here who need my wisdom and experience. Ah, yes, this shall be my Kingdom." Time passed. No one paid much attention to the King because learning and new ideas and songs and explorations were going on in the schools. There was no need to bother the King. They did not know that the King wanted to be bothered. "I'm waiting�.." he said as he drummed his big fingers on the Kingly chair in which he sat. No one came to him, well, no one except his round table of advisors who went with him everywhere, and bowed and scraped and fawned before the King. No one came to see him. They were all at school learning. "I'm here," said the King in a sing-songy voice out loud, "and no one is coming to see me and ask for my permission to do this or that�whatever can be wrong? After all, I AM the King." Still no one came to see him. "This is dum!!!" the King said finally one day in a thunderous voice. "Here I am, the King of the Kingdom and no one is in my court asking and begging and telling and whispering and hanging on my every word! Why be King if no one falls all over me?" Well, when all of his round table of advisors heard this, they began swishing and wishing, wondering and blundering, hurrying and scurrying around in total confusion. "All of you make me nervous! Cut it out!" shouted the King. "Start thinking of a way that would make the children and teachers want to come around me!" "Ah, sir King, perhaps you can issue decrees as to how teachers should teach???" said one groveling advisor, twisting his hands. "You could call it�ah�'scripted' teaching, perhaps?" The second sniveling advisor, not to be outdone by the first, said, "What about 'research-based' programs by which teachers must teach? Teachers must memorize these programs, and do each correctly or else?" "Good, good..but I need more than that." That was when the idea came to the King. "Of course! Why hadn't I thought of it sooner? It is the perfect way to make the teachers and schools and children pay attention to me! I will bring TESTING into this school system! Research-based testing! It shall be hooked to Research-based teaching based on research-based standards! Who will deny research???" Now you must know that no one had ever taken a test in a school of this Kingdom before this day in their life. Kids used to learn for the pure joy of it, for the experience of it, for the wonder of it. Not one of them even knew what a test was!!! They were too busy learning. Of course, each one learned differently, at his or her own speed, but they learned. Over time, they all learned. "Yes, yes, yes! This is the perfect way to get those teachers to grovel and crawl; this is the perfect way to get those students to come round bowing and scraping to get 'special consideration'. It is the perfect way to bring worry, stress, fear of job-loss into this system, and of course, dependence upon ME, the KING! Why didn't I think of this sooner?" and he waggled his head , and said a few 'tsk-tsks' to himself. Then he added, " I will call it�accountability!" Thus, being the King, he issued an Edict Of Accountability --EOA-- as it came to be known. "This is an order of our King! From henceforth -- all students shall be tested, yes, tested so as to see if the schools truly do teach all they purport to teach and in what measure. All methods of teaching shall be research-based and prescriptive. All content will be from research-based standards. Research-based testing shall happen in the spring of each year, and all teachers will be judged by these tests as mediocre, average, or superior teachers according to the levels reached by the students, and so shall be paid. The King shall also be paid more as the average scores rise. Should the scores not rise, more research-based scripted programs will be brought into the schools of low scores. Hear ye! Hear ye! Hear ye!" and all the advisors went away feeling very proud of sounding so official. This news sent the teachers into a tailspin. "What? Tests? Why? Standards? Scripted programs? Why? All learning will stop. Now we will have to prepare our students for these tests." The teachers were definitely NOT happy at this news. But what could be done? It was now the law.